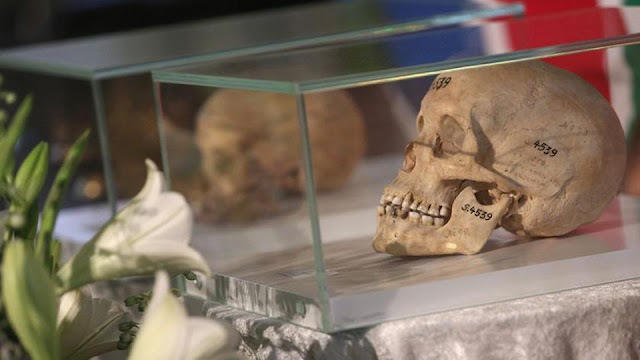 Germany has agreed to speed up the return of human remains and artwork from former African colonies where the country carried out brutal massacres and pillaged indigenous heritage. The German culture and foreign ministries as well as regional and local cultural authorities signed a pledge late Wednesday committing museums and scientific institutions to completing an inventory on their "ethnology, natural history, art and cultural history holdings" from the colonial era. The aim is to determine which "were acquired in a way that legally or ethnically would no longer be acceptable today" and work toward their restitution. "The priority in this work are the human remains dating from the colonial period" in the late 19th and early 20th centuries, the signatories said. The commitment comes after a study commissioned by French President Emmanuel Macron in November 2018 recommended returning African treasures held by French museums -- a radical policy shift seen as putting pressure on other former colonial powers. Germany is unique among the powers in having large holdings of African human remains at museums, universities and in private collections that were used in pseudo-scientific studies. "Research" carried out by German professor Eugen Fischer on the skulls and bones resulted in theories later used by the Nazis to justify the murder of Jews. Germany has on several occasions repatriated human remains to Namibia, where it slaughtered of tens of thousands of indigenous Herero and Nama people between 1904 and 1908. The German government announced in 2016 that it planned to issue an official apology for the atrocities committed by German imperial troops. But it has repeatedly refused to pay direct reparations, citing millions of euros in development aid given to the Namibian government. Beyond German South West Africa (present-day Namibia), the German empire held colonies from Togoland (now Togo) and what was then Kamerun (Cameroon) in the west, across to the far slopes of Mount Kilimanjaro in Tanganyika (Tanzania) in the east, as well as Pacific islands. Germany this year earmarked 1.9 million euros ($2.2 million) to research the provenance of holdings acquired by museums during the colonial period. The project will be spearheaded by the German Lost Art Foundation, which also studies the provenance of art suspected of having been looted by the Nazis. The aim is to determine which "were acquired in a way that legally or ethnically would no longer be acceptable today" and work toward their restitution. Really? Wouldn't that be ethically rather than ethnically?